Starting an online business using the best CMS i.e. WordPress platform is very important. Most of the bloggers and entrepreneurs use WordPress due to its rich features and ease of usage. Just like it is important to share good quality contents for the readers, it is also very much important to use the best theme for your blog. If the platform from which you will share your content doesn’t look neat and well featured, then your online business graph might increase in the slowest speed. 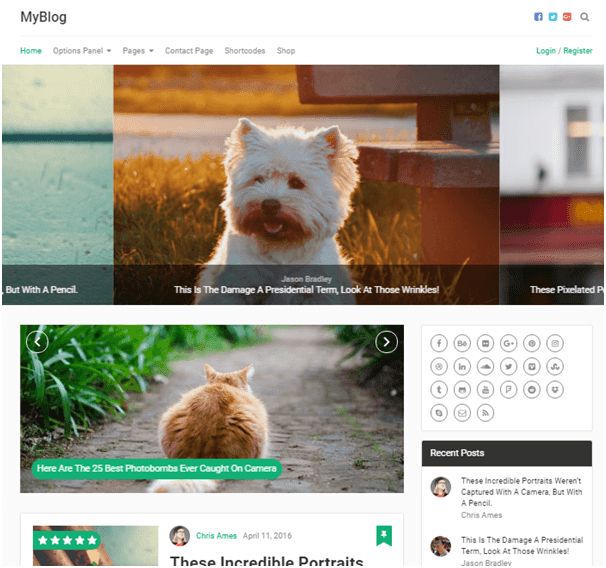 Try these best theme for WordPress blog. 1. Writer Theme: Writer theme from MyThemeShop is a very good theme for every writer or freelancer. The color combination of the theme and the font is excellent for the reading purpose. Not only this, the theme is having three different types of layouts that you can choose as per your requirements. With this theme you will also get unlimited domain usage features, 24*7 support from the developer, installing on one simple click, options panel and also you are getting a money back policy of 30 days which makes it worth buying. 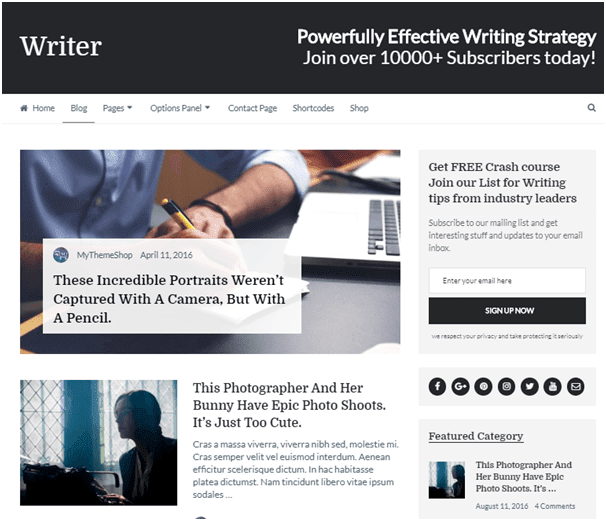 So, there are many features in this Writer theme for which you should go for it if you are willing to post the best content on a better-looking blog. Coming to the cost of the theme it will cost you only $59, as the themes are on sale. 2. Oshine Theme: If you are planning for a big hit in online business then you can go for the Oshine theme which is developed by Envato market. There are lots of template for this theme that you can use according to your needs. Like the Writer theme, this theme is also having some useful features like different blog styles, best performance and much more. You can also use it in a static website and another best part is that you are also having a video playback feature. So, these are all the features that you will get with this theme, so if you are thinking big or want to create a photography blog then this will be the perfect theme for you which you can choose. 3. MyBlog Theme: If you are aiming like featuring on the top blogger in the country, then it is for sure that you shall need to make your blog look professional. MyBlog theme is a new theme which is having a very professional layout which you can install and start blogging. Like the other MyThemeShop themes, this theme comes with the features like money return guarantee, a video tutorial for installing, technical support and much more which you need. Not only this, this theme is completely SEO friendly and easy to use. No doubt this is a premium theme but meanwhile, if you don't have the budget to afford a theme then you can also check the best WordPress free themes. 4. 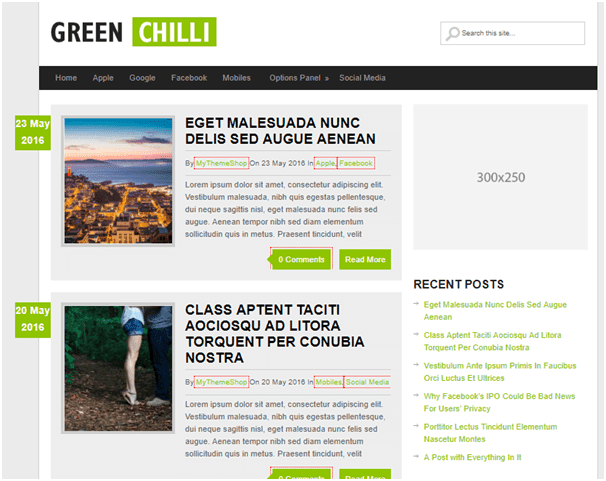 Green Chilli: This is a free theme from MyThemeShop and the best part of this theme is that it is SEO friendly and very easy to use. This is a free theme which you can use on your blog, as the layout of the blog looks better than average. Not only this, you will also get all those features that you are getting on the previously premium themes. Apart from that, you will also get ad management, custom widgets and color shades of different types. So, you can also use this free theme on your blog in the beginning of the blog and upgrade to premium later on. 5. 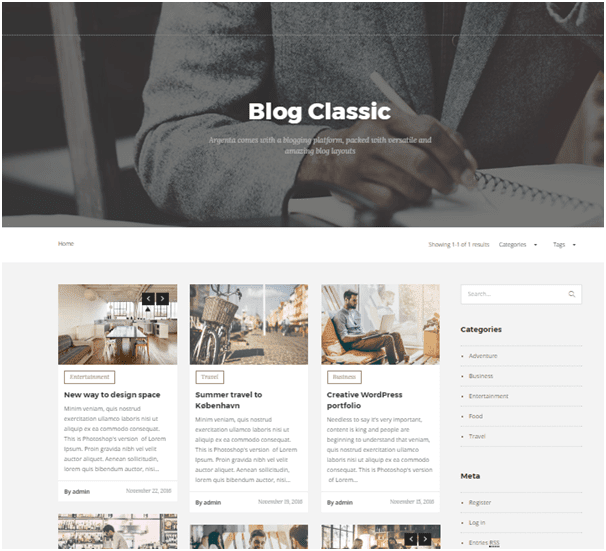 Argenta theme: This is another classic theme that you can use on your blog which will make your blog look professional. This theme is having lots of templates so you can use this theme as a blog, static, portfolio or any other way you wish. And all these things can be set in few simple clicks. The best part of this theme is that it is very responsive on all devices. I am sure that after using this theme not only the visitors will love to browse on your site but you will also love to work on your blog. So, These are all the best themes for WordPress blog that you can use as per your requirements. The themes listed here are having the best features and is also the best for your blog SEO. So, if you are planning something big on the internet and want to give your blog a professional look then these are the list of themes that you should choose for your blog.